There are perfume collectors, and then there are perfume bottle collectors. As a member of the former category, I was glad to have an opportunity to focus on the vessels that contain my beloved scents by attending the New Orleans Museum of Art's exhibit "Scents and Sensibility: Celebrating the History of the Fragrance Bottle." By spanning from 1100 BC to the present and displaying the perfume bottles achronologically, the exhibit succeeded in showing the real diversity in perfume bottles through time. You might think that bottles started off with simple designs, and eventually got more elaborate — but you'd be wrong. Take this charming little pig-shaped flask made of nonlead blown glass.It almost looks like something the Italian designer Alessi, purveyor of whimsical kitchen utensils, might sell today as a salad dressing dispenser. Well, it is from 100 - 300 AD (Roman Empire/Syro Palestine). Cute little fellow, no? In a brief talk during the exhibit's opening night, curator John Keefe explained that the Industrial Revolution's new technologies created an affluent middle class that was able to indulge in luxuries like perfume, which was once associated with the aristocracy.This desire, along with the technological ability to indulge it, meant a flowering of the perfume bottle form into ever-more dazzling designs and colors. Although Chanel perfumer Jacques Polge has said that Chanel was the first significant designer to link perfume to couture (and who wouldn't recognize No. 5's modernist-chic bottle? 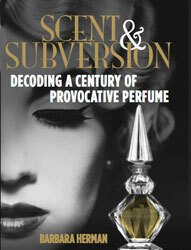 ), John Keefe reminds us that it was actually the English design house headed by Charles Worth (1825 - 1895) that believed a woman needed a perfume appropriate to her "costume," and designer Paul Poiret (1879 - 1944) who first suggested that every design house needed a signature scent that embodied its aesthetic. But this is probably me being a little greedy, or a sign of how much this exhibit made me think about perfume bottles, which I don't usually give much thought to. (OK, maybe I've given some thought to it.) If you're in New Orleans and you love perfume and design, you should definitely check out Scents and Sensibility. (This exhibit runs through October 24, 2010). I dare you not to fantasize about getting into those glass walls to get your dirty little paws on Bal à Versailles, though. Just don't actually do it. "In another minor quibble, I thought it was odd that the show's last contemporary perfume was 1981's Must de Cartier. This might indicate that "simple" is the reigning aesthetic for commercial perfume bottle design. Simple design is certainly still an aesthetic, but there are some over-the-top presentations out there as well. (Anyone seen Thierry Mugler's latest bottle for Womanity? Or Kilian Hennessy's black perfume bottles in lacquered black boxes that come with lock and key?)" How wonderful! Thanks for sharing this. I'm like you - I like perfume for the perfume more than for the bottles. (But then decants are always a disappointment too, aren't they, b/c of their anonymity.) What a snouty little fella that pig is. Just wanna take him home. I guess the exhibition had to stop somewhere but if they had nudged it a little later some Kenzo bottles could have been included. They are the most thoughtful bottles I know (not that I'm an expert!) and they are not made of absurdly expensive materials either. Their success is just based on good design. (I would exclude Ca Sent Beau from that - I bought a bottle recently. Adore the perfume, but the bottle??!! Someone made a critical error of judgment there. So a question - were the bottles in the exhibition all chosen for excellence in design, or for the cultural or historical significance of the perfume as well? Personally I don't think that Shalimar bottle is an aesthetic triumph, but you would not argue with the greatness and the influence of the perfume. I guess I should put by Bal a Versailles in the hard-shell case away for posterity. I bought it on fleabay last year for ten bucks. Of course that was LAST year -- I think the sellers are now wise to the demand for vintage perfumes. Hi Anne, I imagine it was hard to choose what would be in this exhibit. It did attempt to span quite a length of time, and clearly our attachments are to a pretty small segment of 20th century perfume. I think the 20th century perfumes were chosen more for their cultural/historical significance, but in the case of L'Air du Temps, Chanel No. 5 and a few others — design as well. The earlier perfumes were chosen to mark a cultural/technological/economic shift and how the perfume bottles reflected that shift in design or availability to the masses. Olfacta, I was eyeing that Bal à Versailles like a bank robber eyes a pile of cash. You should keep it under lock and key. As for visiting this exhibit...if you do, look me up! What a wonderful exhibition , I love the Shocking bottle. Hi Angela, the Shocking bottle is pretty great. Alas, it's not in the exhibit, but other fabulous bottles I couldn't include in this post are! Thanks for stopping by. You're based in Nola? I didn't know that! I have a whole bunch of relatives in Bay St. Louis, and we usually go to see them every year or so and then go over to Nola to eat, mostly. If it was December I'd be packing the car to go see this exhibit. But...July...will think about it anyway! Olfacta, July in New Orleans is something else. But yes, great eating and a wonderful perfume bottle exhibit. Do it! Wow, what a feast for the eyes - too bad it was not for the nose too! I want that adorable little pig flask! I know, Flora. It was hard just to look and not sniff. :( And yes, piggy was adorable. To think he traveled all this time without getting hurt. Does anyone know what is the year or value of a round carboard container of shalimar plastenes filled with perfume. The carboard container also has an antique marble on top. I also have the same for white shoulders. I am a photo-historian who also collects vintage (1850-1910, Victorian) perfume bottles with a vintage photograph on/in them. They entail many nice European & American designs, plus they contain daguerreotypes,ambrotypes, tintypes,paper, or celluloid photos. The whole history of early photography---worldwide.